Flag global namespace pollution in header files. Right now it only triggers on using declarations and directives. HeaderFileExtensions: a comma-separated list of filename extensions of header files (the filename extensions should not contain "." prefix). "h" by default. For extension-less header files, using an empty string or leaving an empty string between "," if there are other filename extensions. Definition at line 29 of file GlobalNamesInHeadersCheck.h. 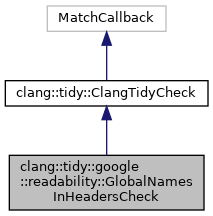 Definition at line 22 of file GlobalNamesInHeadersCheck.cpp. Definition at line 47 of file GlobalNamesInHeadersCheck.cpp. 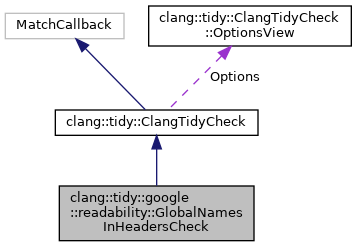 Definition at line 39 of file GlobalNamesInHeadersCheck.cpp. Definition at line 34 of file GlobalNamesInHeadersCheck.cpp.